The Crystal of the Day for Thursday 17 October 2013 is Larimar. Larimar is one of the cardinal Water element stones, yet is born of Fire in its volcanic origins. One of the few crystals to balance the polarities of these energies, Larimar cools tempers and calms fears, relieves stress and nurtures the physical and emotional bodies. It is powerful in meditation and in connecting to the Divine Feminine, and is particularly helpful in releasing emotional bonds, patterns or principles that no longer serve the highest good. A stone of clear communication, it provides the strength and courage needed to speak openly from the heart. Larimar is also known as the Dolphin Stone, Blue Pectolite, Atlantis Stone, and Stefilia’s Stone. Originally discovered in 1916, it was named by the Dominican who re-discovered it in 1974, taking the first letters of his daughter’s name, Larissa, and the Spanish word for the sea, mar, to create Larimar. Use Larimar to overcome fear of doctors, hospitals, injections or surgery. It promotes clear and confident communication with health personnel. Larimar is a wonderful stone for mothers, during and after pregnancy. It helps in alleviating post-partum depression, and relaxes the stress associated with new parenthood. 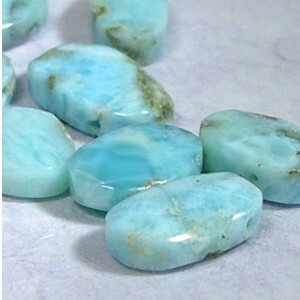 As a soothing Water element stone, Larimar cools hot tempers and guides excessive passion into peace. It may be used to diminish the frequency and intensity of hot flashes, and when one’s kundalini energies have become uncomfortably active. As a crystal of the Throat Chakra, using Larimar in a pendant or laying-on-of-stones treatment will unleash the voice of one’s deepest wisdom. Singers may also find Larimar a wonderful talisman for enhancing and protecting the voice. As a reflexology tool, Larimar opens the acupressure/acupuncture meridians at the feet allowing for the recognition of which painful spots lead to which areas of the body in order to remove and clear the disease. Larimar is used to enhance alternative treatments, particularly those involving heat, light, and water. It is an antidote to emotional extremes and helps ameliorate bipolar disorders. Larimar relieves high blood pressure and stress-related illnesses, and may alleviate excessive Fire element energy such as infection, fever and inflammation. It may also be used to treat skin disorders aggravated by stress, such as hives, rashes, eczema and psoriasis. Larimar is a stone of tremendous benefit to the Throat Chakra, opening the way for clear communication and the ability to speak openly from the heart. The Throat Chakra is the voice of the body, in essence, a pressure valve that allows the energy from the other chakras to be expressed. If it is blocked, or out of balance, it can affect the health of the other chakras. When the throat chakra is in balance and open, it allows for the expression of what we think and what we feel. We can communicate our ideas, beliefs, and emotions, bringing our personal truth out into the world. We have an easy flow of energy within the body and spirit. The energy that springs upward from the lower chakras can continue its path enabling free expression and natural release.